Gonzaga University houses a large collection of material relating to 20th Century singer and actor Harry Lillis (Bing) Crosby, a native of Spokane and alumnus of Gonzaga. Crosby began to donate items to Gonzaga University in preparation for the opening of the Crosby Library in 1957, and today the Crosbyana Room in the Crosby Student Center serves as a museum for Bing's many enduring fans. Items in the Crosby Collection include photographs, audiovisual recordings, paintings and artwork, books, original manuscripts, memorabilia, research material, fan club periodicals, and the entire collection of the Bing Crosby Historical Society of Tacoma, Washington. For a complete inventory of the Crosby Collection, contact the University Archives and Special Collections department at 509-313-3873 or uasc@gonzaga.edu. 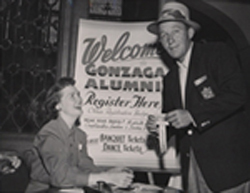 Click on the links below to read about the relationship between Bing Crosby and Gonzaga University over the years. 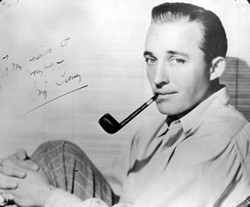 BingCrosby.com - This site is maintained by the Crosby family. It is a great site for information about him and a place to go should you need licensing permission. International Club Crosby - Fan club organization whose publication Bing is published three times annually. For more information, please contact UASC at (509) 313-3873 or uasc@gonzaga.edu. May 3, 2003, marked the 100th anniversary of Bing's birth, and a major event was planned to celebrate his life. A celebration was held the weekend of May 16-18, 2003, on the campus of Gonzaga University in Spokane, Washington, Bing Crosby's home. 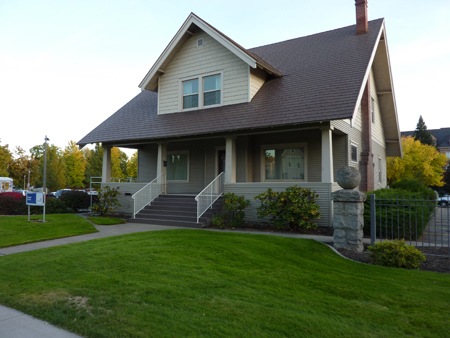 Gonzaga was not only Bing Crosby's alma mater, but his boyhood home is located on the campus. Celebrities and Crosby family members were in attendence, along with a multitude of fans from all over the world. Activities included a Saturday evening banquet , film festival, music, and displays from the Crosby Collection, which houses many of Bing's cherished items, including his Academy Award. Bing Crosby's father Harry and two uncles built Bing's childhood home in 1911 and it has remained in its original location for more than a century. The main floor houses the Bing Crosby Collection, which contains more than 200 items including gold records, trophies, awards, and an official Academy Award given for his performance in Going My Way (1944). The house is open free of charge to the public. Free parking behind the house and handicap parking and ramp on east side of house. Weekdays 9 a.m. - 4:00 p.m.
Saturdays 1 p.m. - 4 p.m.
Like Bing Crosby House on Facebook and instagram! Materials such as some correspondence by Crosby, his family; friends and contemporaries such as Bob Hope, Al Rinker, Rosemary Clooney, and Frank Sinatra. Also includes materials relating to the Bing Crosby Historical Society. A few collections have been processed. Click on the titles to see the inventory. Bing, his family, friends, and contemporaries, and places associated with him: such as his boyhood home in Tacoma. Books in various editions by Crosby; and other books either about him, his family, friends, and contemporaries. Also, includes books owned by him. Newsclippings about Crosby and his family, sheet music, Bing Crosby Pro-Am Golf Programs, scrapbooks about Crosby created by his fans. The Library receives gift subscriptions of periodicals donated by the various Bing Crosby fan clubs, such as Club Crosby and the International Crosby Circle. Includes three dimensional objects such as: ice cream cartons, coloring books, buttons, clothing, etc. The holdings for the book collection is available on the on-line catalog. Bing Crosby Fan Club Periodicals The Bing Crosby Fan Club Periodicals lists the holdings of various periodicals of Crosby fan clubs from throughout the world. For a complete inventory, please contact UASC.